This volume also describes the basic physical principles of AES in simple, largely qualitative, terms understandable by any undergraduate science or engineering student. Major components of typical Auger spectrometers are also described because an understanding of the instrumentation is important to anyone wishing to become a skilled analyst. Mention is also made of other types of analysis for which an Auger electron spectrometer may be used, for example, secondary electron microscopy, backscattered electron imaging, X-ray spectroscopy. The relationship between AES and other analysis techniques is also discussed. 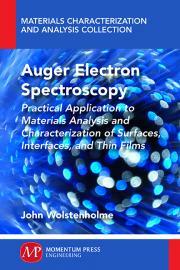 John Wolstenholme, BA, PhD, MRSC, has been involved in surface analytical techniques for most of his professional life and has developed a worldwide reputation in the field of surface analytical instrumentation. After graduating in chemistry from the University of Oxford, he went on to receive a PhD from the University of Manchester, UK. He was employed by Johnson Matthey at the company's research center, working on projects involving catalysts, pigments, and surfaces of biological interest.